Side view of Cottage with large yard. Pool in between Cottage and Main house. Use is shared. Living Room with flat screen TV, DVD, library and ceiling fan. Dining area with plenty of room for four. Queen Bedroom with large closet. Twin bedroom with plenty of storage. Secluded Patio dining just steps out kitchen door. Pool has a rustic, tranquil setting. Neighborhood Tennis Court abuts property. 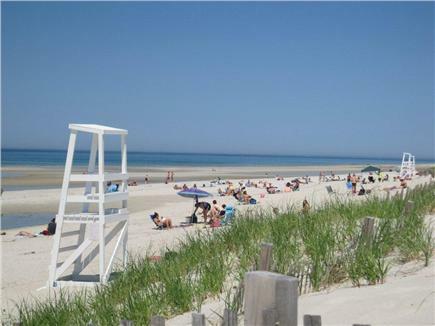 Beautiful Mayflower Beach is just a mile & 1/2 away! 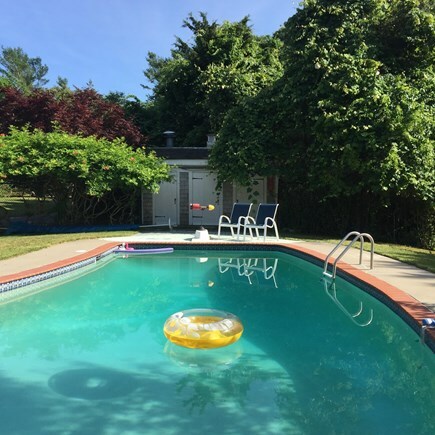 This quaint cottage with a large swimming pool and tennis is located in a quiet, pristine, green area one block from Dennis Village’s main street. We are located in the historic district off 6A. with its shops, restaurants, The Cape Cinema, The Cape Playhouse and Cape Cod Museum of Fine Art. There is also a playground and small park within walking distance or stroll to the Village Green after dinner for a summer time band concert. Ice cream, gelato, fine dining or family dining, a liquor store and 2 markets are all close by. The main house on the property, occupied by the owners, is a 1772 full Cape. The secluded cottage has its own driveway and is on the opposite side of the pool from the main house. Surrounded by greenery, this charming cottage has two bedrooms (queen and twins), a full bath, kitchen and living room. Extra Amenities: cable TV/dvd, Internet, kitchen essentials, stove, refrigerator, microwave, coffeemaker, BBQ, window AC, bed linens and bath towels. The large (20x40) swimming pool is little used by the owners and will seem like a semi-private pool. 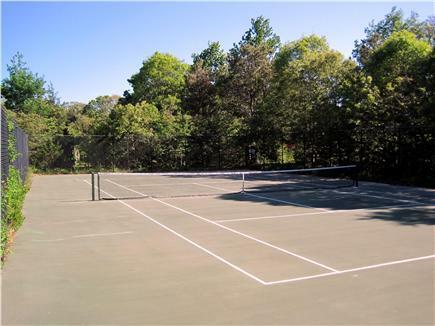 The tennis court, shared with neighbors, is directly behind the cottage. Mayflower Beach and Corporation Beach are a 1½ mile drive or walk. When you return from the beach enjoy a refreshing swim in the pool before dinner. Additional availability info: Saturday to Saturday rental. This is a Saturday to Saturday vacation rental. Additional pricing info: Off season weekly and weekend rates available but pool and tennis unavailable, State and local taxes of 12.45% will apply. This cottage is the right size for a couple or a family with 2 kids. We loved the location. The area was private and quiet, but within walking distance to the stores and restaurants. We also were able to bike to the beach. In addition, the cottage was super clean, very nicely decorated, and the owners supplied pretty much anything needed for the week. The A/Cs were a plus as it was super hot when we were there. We stayed at the cottage for 4 weeks with our two children and loved every minute of it. The cottage has everything you need and was very clean. The location is perfect- an easy walk to stores, restaurants, etc. and close to many beaches. The pool was a plus- our girls loved it! Thank you so much, Allison. It was a pleasure to have your family and we hope to have you again. Quivet really loved meeting the girls! We stayed in this beautiful cottage the summers of 2016 and 2017. It's in a quiet wooded area just off 6A in Dennis Village. Big trees and shade during the hot summer days. Just the two of us used and enjoy that big swimming pool. If you want the old Cape Cod living, this is the cottage for you. As for the owners, They are two of the best. Whatever you need, just ask.